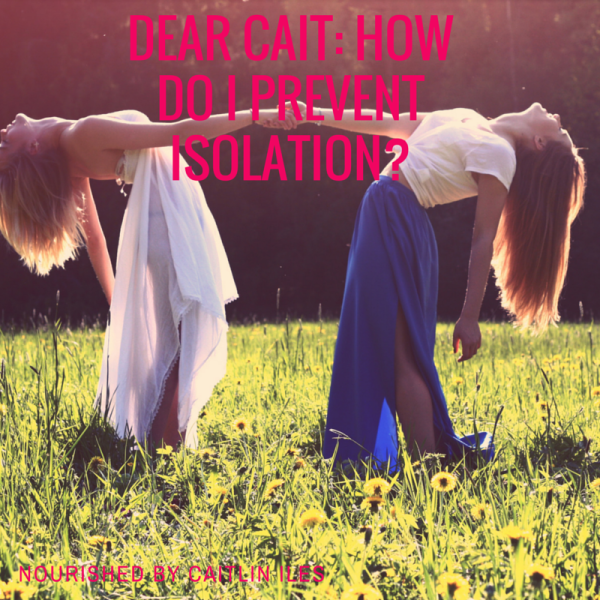 Dear Cait: How do I Prevent Isolation? Hello friends! I hope you’ve been having a great week so far. Mine has been pretty hectic so far, but definitely enjoyable! Today I want answer a question that addresses an issue that I don’t think gets enough attention when us holistic wellness types get going about how to eat and live the very best and healthiest lives. Hey L! Thanks so much for your awesome question. What often gets brushed aside is just how isolating trying to change your diet, overhaul your lifestyle, and make healthier and better choices overall can be. Sometimes we can meet with resistance from those around us who question why we’re making these new choices. Oftentimes this resistance or negativity can come from a place of fear or insecurity in those people who then project it onto you. They see you making positive changes and it makes them feel bad for not doing the same. Or they have you slotted in a specific role in their lives, say as the slightly overweight, always up for a good time, party animal friend, and once you change that role it threatens who they are and who you are to them. Now I’m definitely not saying that the people in your life who are resisting your positive changes are doing so consciously or actively trying to make you feel bad about the new adventure on which you’re embarking (though of course there will always be Negative Nancys in your life whose role in your story you may have to end up reevaluating). What I am saying is that without a supportive community surrounding you during the very fragile time of creating new healthy habits, it can be almost impossible to stick to your changes long term. If your partner is constantly sabotaging your healthy eating efforts by bringing you donuts and treats that he/she knows you can’t resist, even though she/he knows you’re trying to make positive changes by eliminating processed foods and gluten, it can seriously derail you and potentially lead to friction within the relationship. The same goes for friends, family members, or colleagues who are constantly trying to get you to partake of the birthday cake, wine, or chips. Convincing you to eat whatever unhealthy food or drink they’re partaking of can be a way of making them feel better about their choices because if the supposed “healthy” person is eating cake too, then it really can’t be all that bad right? Not cool imaginary person! Not cool at all. So what’s a guy or gal who’s trying to get healthy and change their life to do? I’ve got a couple suggestions that may help make your transition period less stressful and much more likely to succeed! Not bringing home fast food to eat in front of you. Helping you prepare healthy meals for the week. Offering emotional support when things get tough. Keeping treats and snacks stored where you can’t see them/don’t know where to find them. Not planning get togethers at places where you can’t eat or drink anything. Planning active dates or outings together like rock climbing, yoga, hiking, kayaking, or whatever floats your boat! When you go out for meals or get together for holiday dinners there can often be an immense pressure from those there to partake of all the different foods. Now sometimes I do support indulging, if you know what you’re eating isn’t going to cause serious issues. However, if you know dairy makes you feel like crap or wheat causes anxiety or joint pains, then by no means should you cause injury to yourself just to make someone else feel better. My go-to in these situations is just to say that I’m allergic to X food and eating it may kill me. Trust me, no one will be trying to get you to “just have one slice of pie!” after that 😉 Try out a couple of these rebuttals or get creative and come up with your own, but always remain kind and gracious to those who are offering you the food. “Sorry, I can’t have x food. My doctor said I’m allergic.” People are much less likely to give you grief if your nutrition advice comes from a doctor. Bust this one out in various forms. “I’m taking part in a study where I have to eat very specific foods in order to see how it affects my blood markers for heart disease, diabetes, etc.” No one needs to know it’s a study with only one participant hehe. One of the best places I’ve found to connect with likeminded people is on ye olde interwebs! Lots of health websites have online forums, Facebook groups, or community pages that you can join to connect with people from all over the world who are going through similar situations. This means even if you live in Bumfudge Nowhere, population 15, you can still connect with people who are dedicated to making the same changes. In fact, I’ll be launching my Reset Yourself Nutrition Challenge on May 1st, just in time for bathing suit season, and one of the best parts of that event in my opinion is access to the private Facebook group where you can share recipes, successes, setbacks, and ask questions to all the other awesome folks who are participating. Another place to start building community is by joining a fitness class, yoga studio, climbing gym, dance class, or some other activity or sport that you’re passionate about and connecting with the other people who are there. If you’ve discovered you love running, I can pretty much guarantee there is a dedicated running group in your community that would be more than psyched for you to join them. Just by virtue of being in the same place you already have something in common from which to build a connection. Join Meetup.com to look for different groups in your hometown, or closeby, who have the same interests. It’s a great site that takes the dating model of something like OKcupid and applies it to people looking for like-minded individuals with whom to have adventures. Well there you have it friends. A few tips and tricks on building community and helping mitigate the resistance or isolation that can be felt when undertaking a large lifestyle makeover. Do you have any other suggestions for building community? Let us know in the comments! Have a wonderfully whimsical week everyone!